Police in the Iranian capital, Tehran, have arrested 29 people for their involvement in protests against the country's compulsory headscarf law. Masih Alinejad, the Iranian activist behind the "White Wednesday" social media campaign against mandatory hijabs, who is now based in the US, told CNN that the movement has not been influenced from abroad. 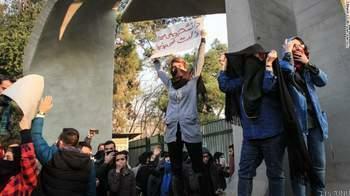 The wave of anti-goverment demonstrations last month was sparked by concerns over rising living costs and a stagnant economy, but also provided an opening for Iranian women to push for equal rights. In the past, women who allowed their hijab to slip could be admonished by the religious police, but these forces have been less prominent under the regime of President Hassan Rouhani. Soheila Jaloodarzadeh, a female member of the Iranian Parliament, said on Wednesday during an event on women's rights that the protests were the conclusion of years of restrictions, the semiofficial Ilna news agency reported.